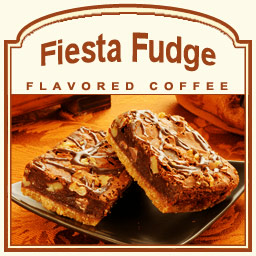 If you are looking for a mid-day pick me up, look no further than the fun Fiesta Fudge flavored coffee. With an infusion of creamy chocolate, this coffee features a rich and tempting fudge flavor that comes with a powerful kick of spice that will surely wake up your senses � even on the slowest of mornings. This dark roasted 100% authentic Arabica bean coffee has undertones of Mexican liqueur that will make your mouth water as it swirls with the decadent chocolate sweetness. Creamy and full-flavored, you won�t be able to get enough of this spicy and smooth 2 calorie cup of coffee. Roasted and shipped on the same day, the Fiesta Fudge will not only taste exceptional but it will be fresh with each and every sip. Packaged in a heat-sealed valve bag to ensure quality and freshness, this Fiesta Fudge will add a little pizzazz to your everyday routine.